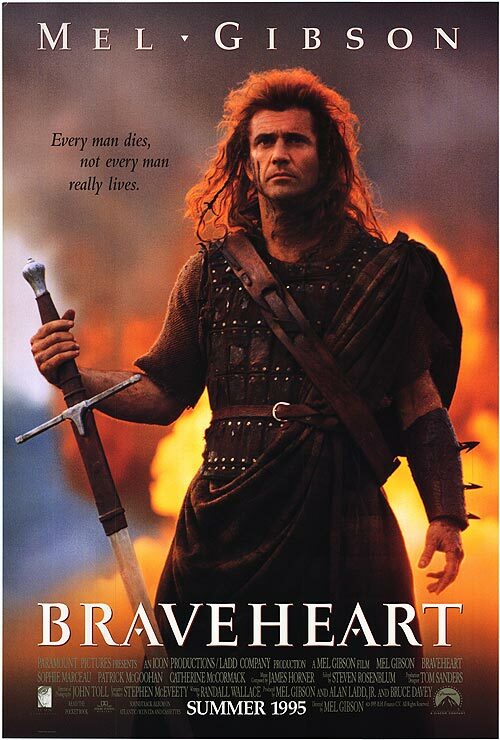 Released fifteen years ago today, on May 24, 1995, was Braveheart, the film directed, produced, and starring Mel Gibson, then a huge, huge Hollywood star. 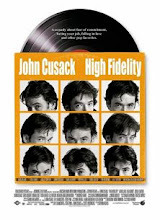 The film won Academy Awards for both Best Picture and Best Director, as well as three other Oscars for this and that. But was it deserving of those accolades then, and does it hold up now, a decade and a half later? In 2010, it's hard not be at least a bit cynical about Braveheart, with its simplistic and historically inaccurate plot, its cartoonish villain King Edward I (played by Patrick McGoohan of "The Prisoner"), and its uncompromising hero protagonist, William Wallace, whose political ideology, as depicted by Gibson, seems to be merely shouting the word "freedom" to the masses. Any hero who struts about spouting platitudes like "Every man dies, not every man truly lives" risks losing the sympathy of the cinema-goer, who may well root for the evil king after that. The direction by Gibson is okay, I suppose, and there are some beautiful shots of Scottish landscapes. But the battle sequences have nothing on the later work of Steven Spielberg, or even Peter Jackson (who was creating fictitious warfare from alternate universes). Watching some of the staged cinematic battle, I wondered if Gibson's philosophy was to simply take a few random wide shots of the chaos, and then, every few seconds, intersperse a staged swing of the sword by Wallace or some other heroic Scotsmen, and then repeat that process again and again. That sort of back and forth cutting doesn't really do the entire battle justice; rather, it seems that there was little thought to the choreography of the battle as a whole. They are hardly epic scenes. Perhaps one of the narrative mistakes was to attempt to tell a full origin story of Wallace, a historical figure whose true origin and family life is mostly unknown (save for an inaccurate historical poem which served as the basis for screenwriter Randall Wallace's script). The film starts in his youth, during which his formative experiences include seeing the aftermath of the English king's treachery and the ultimate death of this father and brother at the hands of the English. Young Wallace falls in love Murron MacClannough (Catherine McCormack), who he secretly marries in order to prevent an English lord from claiming a right under the curious doctrine of jus primae noctics (which, essentially, means that the governing English lord can sleep with any bride in the region on her wedding night). But their secret marriage does not last long; Murron is executed by the English after an altercation with an English soldier. The sudden loss of his love drives Wallace to join an already brewing rebellion against the English king. (Curiously, in his later and very similar film, The Patriot, it is again the loss of a loved one, and not politics, that causes Gibson's protagonist to enter into an armed uprising against the English.). The rest of the film is battle after battle and scene of purported political intrigue after scene of purported political intrigue. Historical figures who were never in the same room somehow find each other and interact as friends, enemies, or lovers. 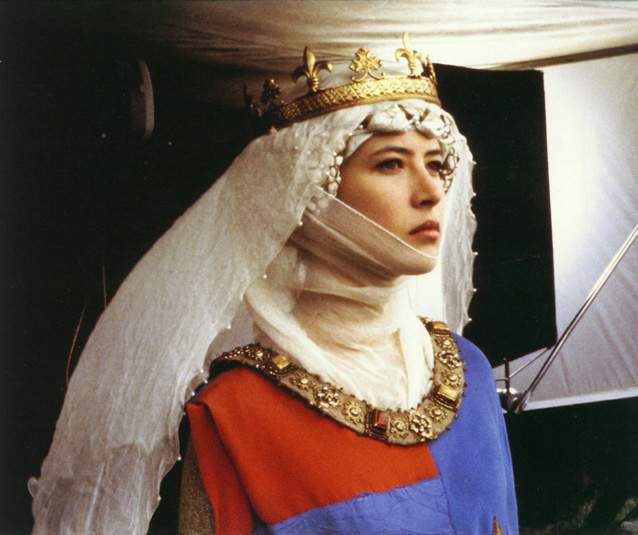 (You can't help but roll your eyes when Gibson's Wallace somehow beds Princess Isabelle (the lovely French actress Sophie Marceau), wife of Prince Edward, son of the film's villain, King Edward I). All of this is done in the name of drama. Perhaps Gibson wanted to craft an "epic film," but unfortunately, an epic is not just a period piece with a running time approaching three hours. 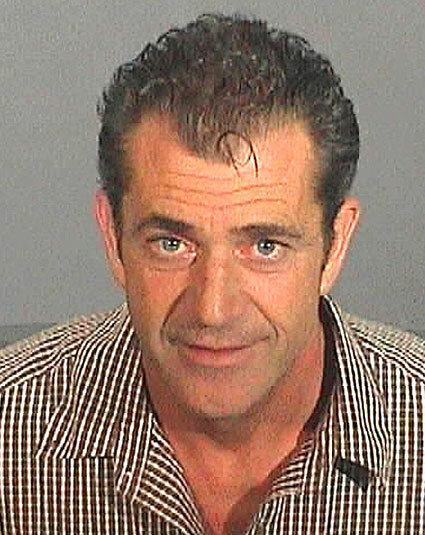 Gibson's off screen antics of the past few years really have thwarted his ability to occupy a role, even those that he took and performed many years before those antics. Perhaps it's unfair to judge a 1995 would-be epic by the subsequent misbehavior of its star, but it can't be helped. Watching the film again, I couldn't quite put my finger on my misgivings with the script, then I turned to Wikipedia for a bit of context: Screenwriter Randall Wallace would go on to pen 2001's disastrous Pearl Harbor (starring Ben Affleck) as well as write and direct the mediocre Gibson flick, We Were Soldiers in 2002. He wrote songs with Richard Marx in 2008. There you go. In sum, the film is dated, overly simplistic, and cliche-ridden, not unlike most films Gibson has done since 1995. It's a shame, really, because Gibson was once a likable and bankable star, but now, he's just a paranoid parody of himself who has gone too far off the reservation. When he decided that he wanted to be a "serious film-maker," that was the end of the Gibson we knew. 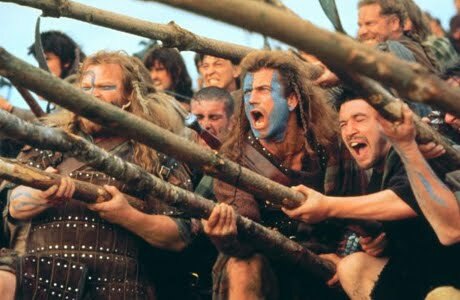 Braveheart is where all of that began, meaning that today is not much of an anniversary. Oh, man. While I agree with some of what you are saying, I do believe Braveheart is a great movie. I have to laugh at it, but if I get past the cheeseiness and take it for what it is, I love it. Though, I feel this way about many films that desire to shove epicness in your face. Another reason I love Robin Hood even though I have not seen it as of yet. Also, my dad is an old Vietnam vet and watched Braveheart at minimum twice a week, the entire time yelling "Freedom!" at whatever spots of the film he feels compelled. It's become his trademark. When I watched it again this past weekend in anticipation of this post, I guess I just couldn't get past the cheesiness of it. It seems to me that if a producer is going to dedicate all of those resources to making a would-be historical epic, why not make a good one? I remember laughing at the scene where Princess Isabelle insinuates that she's carrying Wallace's child and the old kind looks like he's going to choke. It reminded me of an old Benny Hill skit. A little over the top, especially considering that the princess (who was actually Spanish and about 2 or 3 years old at the time) never even met Wallace.